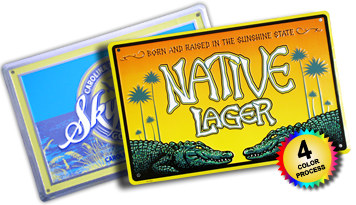 For nearly 20 years Tags America has been an official distributor for Dixiline, the number one manufacturer of custom metal signs and embossed aluminum promotional products. We are extremely proud to represent the absolute highest quality business advertising signs and custom front license plates available in the market today. Our budget friendly advertising solutions are an economical way for car dealerships, breweries, fence companies, and many other types of businesses to actively promote their brand. Other organizations such as schools, social clubs, fraternal clubs and religious organizations use our custom metal signs for profitable fund raising campaigns. 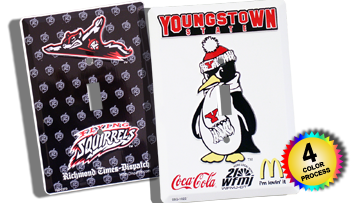 All of our business advertising signs are made in the USA and manufactured from recycled aluminum. 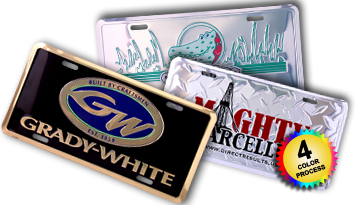 You’ll be confident knowing that when you purchase custom metal signs or license plates from Tags America you’re contributing to the growth and stability of the U.S. economy and being environmentally conscious at the same time. Our goal is to deliver a product that meets all of your specific requirements. If you have a logo or design prepared in advance, you’re welcome to provide us with your vector art work. 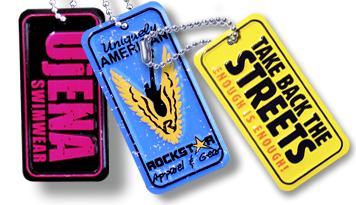 If you’re starting from scratch, Tags America also provides design services to help you get that “one-of-a-kind” look you desire. Take a look at what some of our other customers have done. Get your wheels turning and your juices flowing. Consider all the possibilities. Then again, if you already know what you want, call us right away at (603) 527-8030 for your custom price quote.